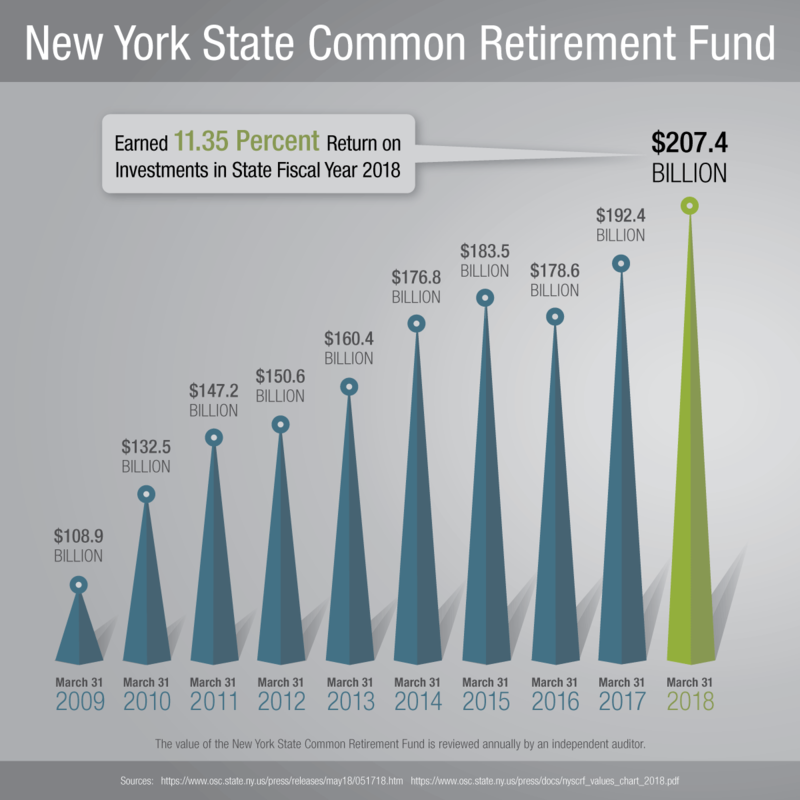 The New York State Common Retirement Fund (Fund) holds retirement investments in trust for more than 1 million New York State and Local Retirement System (NYSLRS) members. In the State fiscal year ending March 31, 2018, it generated strong investment returns of 11.35 percent. The Fund ended the year with an audited value of $207.4 billion. Independent studies regularly confirm the financial soundness of NYSLRS. 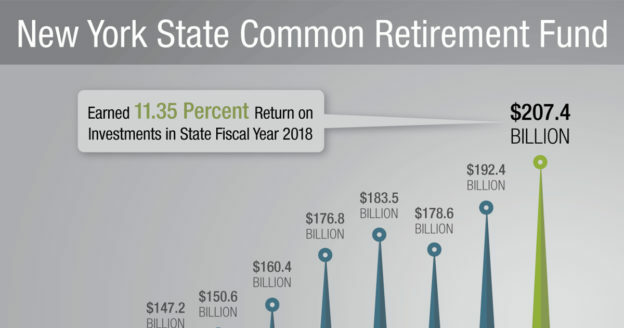 Just this year, a study by the Pew Charitable Trusts ranked NYSLRS among the best-funded state retirement systems. In fact, a new State fiscal year 2018 report from our actuary ranks NYSLRS at 98 percent funded, which puts us well above the national average of 66 percent funded. The Fund is the country’s third-largest public pension fund. NYSLRS provides retirement security to more than 1 million active state and local government employees, retirees and their beneficiaries. During the fiscal year that ended March 31, 2018, NYSLRS paid out $11.45 billion in retirement and death benefits. More than $9.8 billion of that went to residents of New York State, which generated local spending and provided economic support to New York businesses and communities. While successfully providing financial security for New York’s government workers and retirees, Comptroller DiNapoli’s has also put investment dollars to work helping New York businesses grow and addressing the long-term threat of climate change. The In-State Private Equity Program invests in New York-based business ventures, companies and other programs that spur economic growth and create and retain jobs. Recently, Comptroller DiNapoli raised the program’s total commitments to $1.6 billion. Since 2000, it has returned $863 million on $583 million invested in 139 transactions. And recently, the Asset Owners Disclosure Project once again named the Fund as the number one U.S. pension fund — and the third globally — for its work to address climate risk. The Fund’s portfolio includes $7 billion dedicated to sustainable investments, including $4 billion in a low emissions index that shifts stock holdings away from the biggest carbon emitters. Content last revised October 9, 2018. This entry was posted in Pension Fund, Pension System and tagged Common Retirement Fund, Comptroller Thomas P. DiNapoli, fund, growth, growth of NYSLRS, investment return, members, New York State & Local Retirement System, New York State Common Retirement Fund, NYSLRS, NYSLRS Retirees, One of America's Largest Pension Systems, Pension System, public pension fund, retirement, retirement security on October 4, 2018 by NYSLRS. When NYSLRS formed in 1921, it started with a total of 4,721 participants (4,672 members and 43 retirees). Today, NYSLRS provides retirement security to 643,178 members and 430,308 retirees and beneficiaries (the most recent data available). To say we’ve grown would be an understatement. But no matter how large we get, NYSLRS will continue to provide its members and retirees with lifetime retirement benefits and help them to plan for a financially secure future. A look back at membership growth through the years. Before NYSLRS began in 1921, many New York public employees who were no longer able to work would fall into poverty. At the time, Social Security didn’t exist to help supplement post-retirement income. While Social Security was created in 1935, it wasn’t made available to public employees until 1950 and didn’t start in New York until 1953. Under State Comptroller Frank C. Moore, NYSLRS was comprised of 161,686 participants in 1950. Of those, 151,326 were Employees’ Retirement System (ERS) members and 10,360 were retirees and beneficiaries. You may have noticed that there were no Police and Fire Retirement System (PFRS) members in 1950. We had police and fire members – a little more than 12,000, in fact – but they were considered ERS members until 1967. On April 1, 1967, ERS split into the two systems you know today: ERS and PFRS. 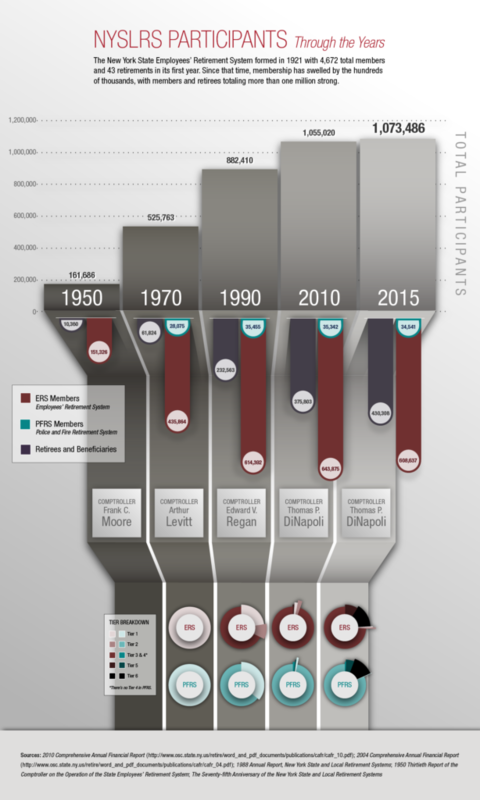 Participation in NYSLRS grew to 525,763 in 1970. Of these, 463,939 were members and 51,824 were retirees and beneficiaries. The State Comptroller at the time was Arthur Levitt Sr. Comptroller Levitt is known for having the longest tenure as State Comptroller, serving a total of 24 years from 1955 to 1978. The 1970s also saw the creation of a new member group. Tier 2 began on July 1, 1973. The creation of Tier 2, and the other tiers that followed, were designed to provide members equitable benefits at a reasonable cost. From 1979 to 1993, Edward V. “Ned” Regan served as State Comptroller. During his time in office, participation in NYSLRS continued to climb, growing to 882,410 in 1990. Of these, 649,847 were members and 232,563 were retirees and beneficiaries. Between 2006 and 2007, participation in NYSLRS broke the one-million-participant mark. In 2010, during current Comptroller Thomas P. DiNapoli’s administration, participation rose to 1,055,020. Of these, 679,217 were members and 375,803 were retirees and beneficiaries. In 2015, overall membership in the System reached 1,073,486. This includes 643,178 members and 430,308 retirees and beneficiaries (the most recent data available). The number of retirees is increasing more quickly than members. For example, in 1995, retirees represented 30 percent of the System’s members. By 2015, that number had increased to approximately 40 percent. What does 2016 hold for NYSLRS? Keep an eye out in future blog posts for the latest NYSLRS demographics. Content last revised June 29, 2016. This entry was posted in General News, Members and tagged 1950, 1970, 1990, 2010, 2015, beneficiary, Comptroller Frank C. Moore, Comptroller Levitt, Comptroller Regan, Comptroller Thomas P. DiNapoli, demographics, ERS, growth of NYSLRS, members, membership, New Members, New York State & Local Retirement System, NYSLRS, NYSLRS through the years, NYSLRS total participants, PFRS, Retirees, retirement security, Social Security on June 29, 2016 by NYSLRS.